Romi Neustadt is passionate about helping others build lucrative direct sales and network marketing businesses that help create lives with more freedom and flexibility, greater purpose and a lot more fun. In this book she offers you the same direct, no-BS coaching she’s given to tens of thousands to help you acquire the skills to build this sucker and teach your team to do the same. And, equally important, she’ll work on your mindset so you stop overcomplicating it all and stop letting the negative voices in your head win. • The Possibilities for a lucrative, efficient and enormously rewarding turn key business. To ask other readers questions about Get Over Your Damn Self, please sign up. Get out your highlighter! You're gonna need it. Love this book and all it has to offer for new as well as seasoned DS entrepreneurs. It's full of no BS advice, short, simple and easy to follow. It reads as if Romi is next to you, hanging out, chatting with her friends. Great asset to my growing business. This book was also full of practical advice. It was longer than Rock Your Network Marketing Business and had more stories. It had a bit of language and bluntness, but also some humor. It was helpful, even if not written in my favorite way. I feel like this is seriously the textbook for anyone working a home based business or network marketing to be (1) authentic (2) not sleazy and (3) helping others while helping yourself first. I’ve read it before and continually have solid takeaways and good lessons to make me better at my job. Definitely get it for your shelf and read often. Absolutely inspirational. I learned so much. I love her clear, concise, no-nonsense approach to business and to teaching us (women) how to run a successful business. Applying some of her techniques has already started improving aspects of my business. If you can get past the swear words, it is well worth the read! I will be reading again. I did not expect this book to be so good and so enjoyable. So many wonderful nuggets. This book definitely helps you get your act together. A must-read for any network marketer! I’m giving this book 4 stars because I do think her advice is sound and full proof. I think if anyone takes this advice to heart and goes all in they will almost certainly find success. However reading this book has made realize that network marketing isn’t my dream. I have zero desire to attack my direct sales business plan like she does. When I was reading a lot of her advice on what to do and what to say It made me feel slimy and spammy, it does not fit my personality, I would feel forced and I’m giving this book 4 stars because I do think her advice is sound and full proof. I think if anyone takes this advice to heart and goes all in they will almost certainly find success. However reading this book has made realize that network marketing isn’t my dream. I have zero desire to attack my direct sales business plan like she does. When I was reading a lot of her advice on what to do and what to say It made me feel slimy and spammy, it does not fit my personality, I would feel forced and fake speaking to people about my business like she suggests. Her advice made me realize I do direct sales for a completely different reason. I do it to have fun, with the money side of it and ranking up side of it my last priority. It made me realize I’m not into the politics of network marketing, I like people but not enough to talk to 5 different people every day. I love being at home and enjoying my own company so the last thing I want to do on the weekends is go out in public and meet strangers to tell them about my business. It definitely gives one perspective on how to recruit, and qualify people for your Network Marketing business, it unfortunately also is exactly why people are turned off to an otherwise very attractive business model. 1. You will have to talk to a lot of people and grow your network to build a network marketing business. (I know this seems obvious but so many people get into a business thinking that they are going to grow a massive organization by staying with It definitely gives one perspective on how to recruit, and qualify people for your Network Marketing business, it unfortunately also is exactly why people are turned off to an otherwise very attractive business model. 2. You do need to identify prospects “why” - I think this came off as a bit manipulative in the book. But it is a very strong workflow for building a team of motivated people - it’s also important to note that it is a really good way to get to know people on your team in a deeper more meaningful way. Big fat meh. Also, there was a review that mentioned that the profanity was too much and I thought, “Lighten up, sensitive reader.” But having listened to the whole audiobook, I actually found the amount of the f-bombs distracting and they begin to lose their emphasis two-thirds of the way through the book. Having worked in an MLM before without much success, I can tell you if I had THIS TRAINING back then it would have changed things. If you are serious about building a successful business this book will show you what you need to do. Then it's up to you to DO IT! I love Romi's straight to the point, no sugar coating tough love and I bet you will too. I was looking forward to reading this book, but after the intro it seems she was trying to sell me something. I did not find what I was looking for in it so I skipped around to try and find anything useful to no avail. Looking for some motivational help? This is the book for you. I recently started my own LipSense by Senegence business and my upline recommended I read it. Romi Neustadt really lays it all out for you. The number one reason for your failure, is your own stubborness. Get up and Show up! In order to succeed you have to do the work. Read with our Burgess Bunch Strive for Five Group Summer 2017 and honestly wondered why I hadn't read it sooner. So many wonderful tips, tricks and wording. This is truly a must-read for anyone in network marketing--not just R+F. Only gave it 4 stars because I think she could have communicated the same concepts without the ugly, often unprofessional language. I found the description of the book to be very deceiving, and did not realize until I had purchased it that it was completely focused on MLM businesses. I tried to keep reading, as I thought perhaps I could still derive some sale tips or business plan ideas from the author, but in the end skimmed the rest as it was all about how to turn every possible relationship into a transaction. I love the directness and realness of this book. Starting my 10th year in network marketing, I knew a lot of what was in this book (and some of which was written in our founders book 55 years ago) it's good to get a different perspective. Now it's time to go back and implement step by step what she talked about. I was challenged to read this book after I signed up to sell SeneGence Beauty products. I was told t was amazing, I was told it would change my life, and I was not told wrong. The biggest challenge you will have after reading this is actually FOLLOWING through with what you just read. You have to be the person who wants to Get Over Your Damn Self. If you’ve never ever read a single self help hook, or any entrepreneurial type book, great! This is the best way to sum up any major point of everyone’s work. If you have read any other type business builder book? Have a great teaching team of leaders, ... do not waste your time! Proof anyone can indeed write a book. A must-read for every entrepreneur! Simply amazing. I love Romi’s straight-on, tell-it-like-it-is, take no bs attitude. If you’re serious about building your business, then get to reading. its alright. She has probably given good advise , but too often it's same thing you see in other salees books. Title suggested that book would be about "Damn Self" . But it tries to touching so many topics that it ends up doing justice with none. Great information mixed with humor for a solid foundation in any MLM business or just promoting the dickens out of your own. I didn't care for the unnecessary language bombs, but realized there would be some from the title. As a first time network marketing boss I found this book helpful in so many ways. It's become the background thoughts running through my head as navigate through the days. Thank you for putting yourself out there to help so many others! A great no-nonsense approach to what is necessary to build a strong business in the multi-level marketing world. I especially enjoyed her real life stories and the wording she gave for specific scenarios. A must read! Romi Neustadt is a former corporate chick (first a lawyer, then a PR executive) who traded in the billable hour for more time and financial freedom through a career in network marketing. She built a 7-figure business in less than three years that's allowed her and her doctor husband John to design the life they really wanted. Romi loves unlocking the potential in others so they, too, can choose ho Romi Neustadt is a former corporate chick (first a lawyer, then a PR executive) who traded in the billable hour for more time and financial freedom through a career in network marketing. She built a 7-figure business in less than three years that's allowed her and her doctor husband John to design the life they really wanted. Romi loves unlocking the potential in others so they, too, can choose how they live, work, parent and play. 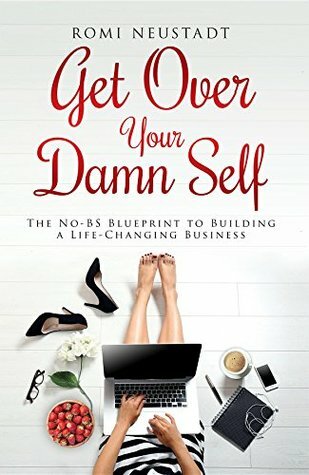 Her book, Get Over Your Damn Self: The No-BS Blueprint to Building a Life-Changing Business, has consistently ranked #1 on several Amazon lists since its release in the Fall of 2016, and received a GOLD AWARD from the Nonfiction Authors Association. Romi lives in San Diego with John and their two proudest achievements, Nate and Bebe.